Stocks continue to digest the gains made in early November without giving up against the negative news backdrop. That’s a well supported, resilient market. When the major indices close above their November highs, we should see a quick spurt to the upside. If they fail to do so this week, I would not be surprised at all to see a mild 1-3% pullback lasting a week or two to set up the Santa Claus rally into 2016. My theme remains the exact same as it’s been since late August. Buy weakness! Sector leadership remains very strong and encouraging, despite what I keep reading about a narrow stock market rally. Semis are breaking out. Consumer discretionary is near all-time highs. Banks should break out later this month. Transports seem to be gearing up for a move. 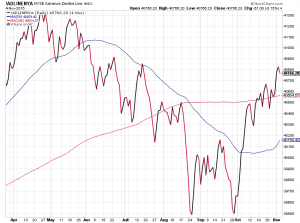 My main concern continues to be the putrid performance of the high yield (junk) bond sector. With energy, metals and mining in real danger, those bonds are at risk for default, not to mention the very real possibility that some of these companies won’t be able to refinance next year. Stocks came into the week on their heels from the recent pullback and the horrific terrorist attacks in Paris. In my previous post, I offered that the odds favored some more weakness with a reversal this week. The market saw a quick bout of weakness to open the week, but quickly reversed into a very strong day for the bulls on Monday. While Tuesday saw some internal soft spots, the bears will have a tough time taking control unless stocks close below Monday’s low. At this point on the index side, we need to pay close attention to the leader. Bulls like me do not want to see the Dow taking charge over the other major indices. I remain of the opinion that all-time highs are not too far away. On the sector front, I am loving the action in consumer discretionary, transports, internets and industrials. I can’t tell you how many times I hear financial reporters or pundits say that industrials can’t rally with a strong dollar. Clearly, these people never do their homework because it’s happened many times before and right now as well! High yield bonds remain a concern, but perhaps Monday’s reversal will give them some upward energy. I am not ruling out that this canary in the coal mine already peaked for this bull market and will assume a laggard role until the next bear market hits. Stocks continue under pressure as they pullback from the huge run last month. 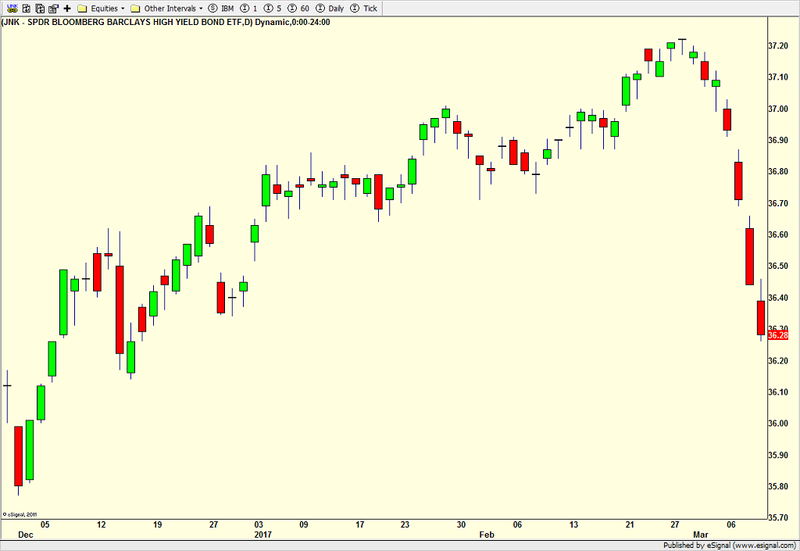 Last week, I offered that this week would be the buying opportunity, but the pullback has been deeper than I expected. “Relentless” would be an exaggeration, but there has certainly been some strong selling. While Friday’s action did show the major indices mostly down 1%+, the selling was less severe than Thursday. Going in to next week, volatility should continue to be on the high side and I do not believe the bottom is in just yet. The market has the look and feel of wanting one or two more down days next week, but the odds do favor a reversal and rally by the end of next week. Sector selling was downright ugly, but it was not across the board. In fact, materials, industrials, energy and biotech bucked the strong downdraft to close the week. The first three of those sectors, according to the pundits, should be hit even harder with a strong dollar, but that was not the case. It usually pays to confirm what you hear as absolute from the talking heads. High yield bonds continued their decline and it looks like they are headed back to their 2015 lows in short order. This sector has been very frustrating to trade for the past 18 months and I would almost say that it’s been more difficult now than at any time over the past 20 years. For full disclosure, I run two high yield bond strategies that have been challenging so I may be a little close to the trees. Have a great weekend! I am so looking forward to being local with my family!! The pullback that began last Wednesday in the major stock market indices continues. It’s been orderly and constructive so far and if the super bullish case remains, it should wrap up sooner than later. The stock market is digesting the better than expected employment report and is coming to terms with a December rate hike by the Fed. The banks and discretionary continue to lead which is a positive sign over the intermediate-term. Transports are transitioning to leadership and that’s also a good sign. Energy is trying to step up as I type this and that group offers a nice risk/reward. I have gone from very positive to very concerned about high yield bonds. With the strong stock backdrop, they should be acting a whole lot better. Stocks are finally seeing some pause in the relentless rally that began a little over a month ago. It should be mild, relatively painless and in the 1-3% range. As I continue to mention, any and all weakness is a buying opportunity until proven otherwise. And there’s a chance that the “proven otherwise” won’t be seen until well into 2016. Internally, the stock market has been and is on solid footing. 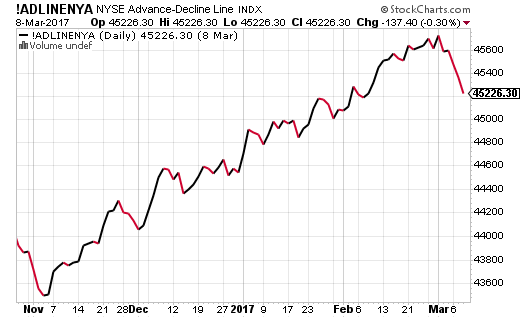 As you can see from the chart below, the NYSE Advance/Decline line continues to rally from early October. That shows more and more stocks are participating in the advance. The key thing will be if this indicator moves up to an all-time high, which would further insulate stocks from significant weakness and forestall any bear market. Right now, banks are holding up really well, anticipating a December rate hike by the Fed. Should the banks maintain their leadership, that would positive ramifications into 2016. Finally, high yield bonds are hanging in with energy pulling back. If this continues, it would be yet another plus in a long line of positives. As bullish as I have been, and I don’t think many have been as positive as I have been, the stock market is now starting to surprise even me on the upside. Coming in to the week, stocks were looking a little tired and in need of some rest, either by going sideways for a few weeks or by seeing a mild pullback of 1-3%. Instead, stocks are continuing to move higher although the rate of acceleration has slowed. I keep hearing the bears disavow and dismiss the rally, but their rationale has become even more absurd. I am even starting to see bearish analysts make personal attacks. I guess the pain is starting to hurt from having their throats’ stepped on. It’s very interesting to note that sector leadership is very different so far this week than it’s been. Energy has been the big winner, finally stepping up to lead. Beaten down biotechs have also seen some love. This is important because it shows very strong underlying demand for stocks as certain sectors rest while others take their place. High yield bonds also continue to behave well and I am sticking with my forecast that this could be a run right into 2016. In short, nothing has changed from four weeks ago in that any and all weakness should be bought. It’s just that after a 2000 point rally in the Dow, risk is higher than it was. After a huge win for the bulls last week, stocks have become very short-term overbought. I don’t think the rally is over nor do I think any meaningful weakness will unfold. Rather, I think the bulls need a pause to refresh which can be accomplished by going sideways for a period of time or seeing a quick pullback. Either way, new highs should be up next and buying any weakness is the strategy until proven otherwise. Am I certain that stocks will hesitate right here? No, but that’s the preferred path to keep things healthy, especially into the Fed meeting this week. I am keenly watching gold as it held up very well in the face of a strong dollar last week. Gold has nicely digested the big rally from my sub $1100 target and could be setting up for a $100 move higher. “Could” is the operative word here, not “will” just yet. Finally, as I mentioned before, strong high yield bond performance is essential for this rally to run right into 2016. 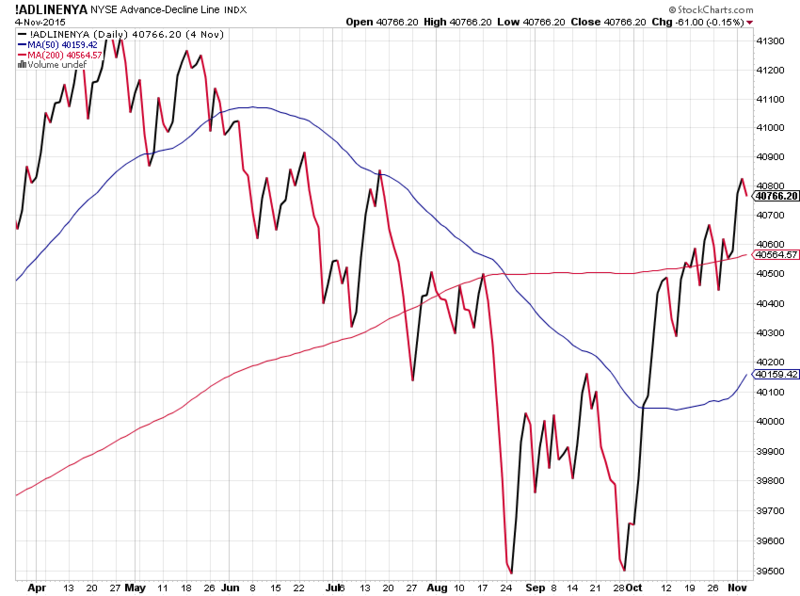 So far, so good, but the junk sector needs to hang in during any stock market short bout of weakness. After two straight down days and four days of pause overall, the bulls roared back to life on Thursday as you would normally expect during a powerful move off a bottom. It’s that first mild pullback from a significant low where the bears get a little excited that it could be another leg down, but all of the Johnny Come Lately bulls realize it may be their last chance to get on board. More pain for the bears. Recent sentiment data has not revealed a large shift from bearish to bullish sentiment. Investors remain skeptical about this rally. Stocks are still being shorted (play on lower prices). This is all further fuel for higher prices. Weakness should be bought, possibly right into the New Year. Thursday was a very strong day internally for stocks as well as sector leadership. With options expiration on Friday, it’s unlikely that another strong day will follow. Looking at my four key sectors, semis and consumer discretionary are already above their September peaks. The transports have come back from the dead after being in their own bear market all year. Only the banks haven’t really stepped up yet, but I wouldn’t count them out. At this point, I want to see high yield bonds really get in gear. As my favorite canary in the coal mine, their strength would further support my continued forecast for all-time highs in the major indices with Dow 20,000 on tap for 2016. If you haven’t read my various pieces on post crash behavior and back to back negative August and Septembers, click on the blog icon up top. I have two more pieces I am about to publish and you won’t be surprised to learn that they, too, portend higher stock prices.